A fire can charge through a building in no time. Injuring people, destroying assets, threatening the very existence of your business. What makes it all the more tragic is that simple proven steps can help reduce the risk of accidents. 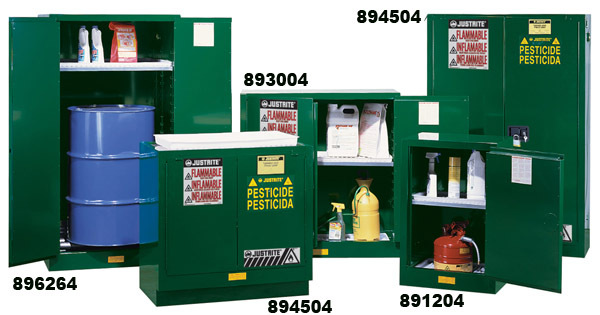 A wide variety of code compliant cabinets are available in sizes ranging from 4-gallons (15 liters) to 120-gallons (454 liters). 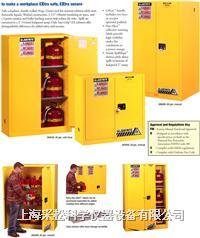 Smaller cabinets allow solvents to be stored at worksite locations saving costly trips to a central storage room. Undercounter, wall mount and piggyback style cabinets add to safe storage, even when space is at a premium. 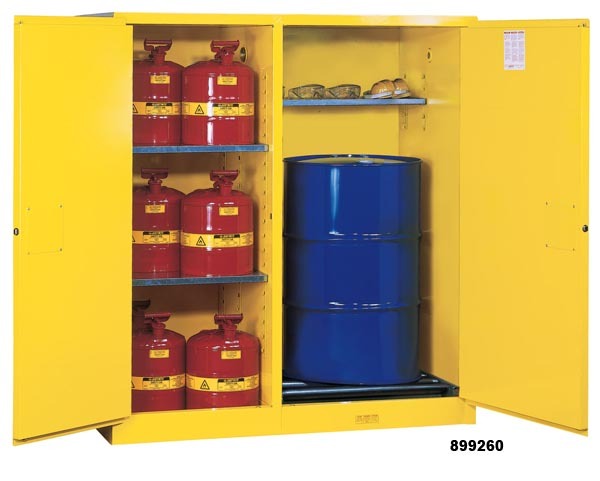 For high capacity storage, including storage of 55-gallon drums, larger sized cabinets designed specifically to house 30-gallon (114 liter) or 55-gallon (208 liter) drums are available. It's important to note that OSHA Code 29 CFR 1910.106 states that not more than 60-gallons may be Class I and II liquids. Custom sized cabinets are also available for unique requirements. Wall Mount Safety Cabinets make the most of usable storage space. Wall Mount Cabinets are ideal for storing small containers near work areas without taking up extra floor space. Eye level positioning allows for easy access to solvents. Only 12" deep, the 20-gallon model features five adjustable shelves to accommodate multiple containers. Both sizes come complete with mounting hardware. Conveniently locate liquids near work areas. 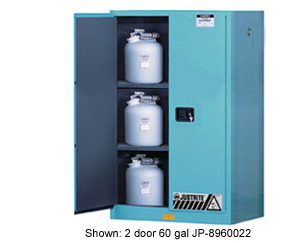 Expand storage and safely segregate liquids. 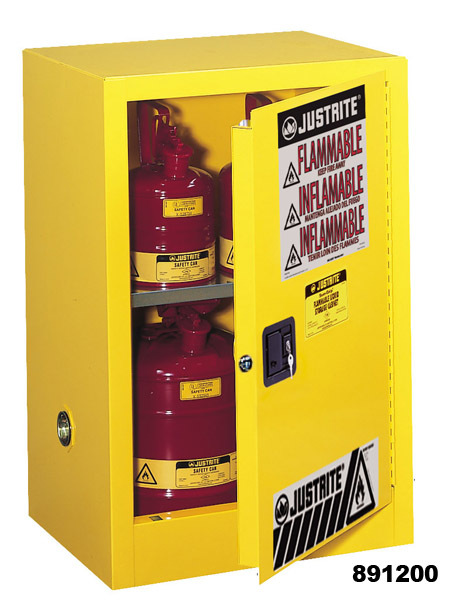 Justrite Piggyback Cabinets provide additional safe storage for flammables without taking up valuable floor space. 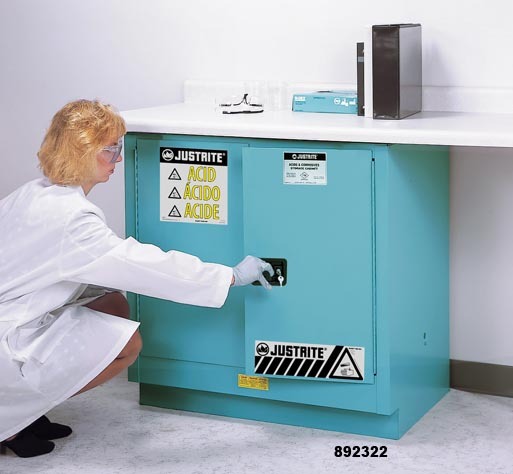 Designed to mount on top of Justrites standard 30- and 45-gallon manual or self-close cabinets, they can also be used singly as a benchtop cabinet or stacked to provide additional storage. Piggyback Cabinets also lend themselves to wall mounting with the purchase of a Wall Hanger Assembly. Piggyback units are not to be used with sliding door cabinets. H x W x D (mm) Approv./Lstg. 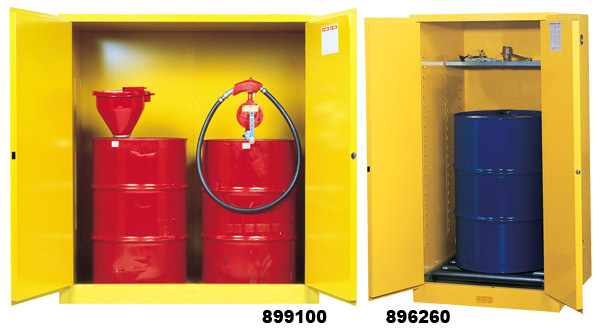 Vertical Drum Storage Cabinets safely house one or two 30- to 55-gallon drums. All cabinets are supplied with a removable, adjustable half-depth shelf to store Class III materials or spare accessories such as drum funnels, vents and antistatic wires. 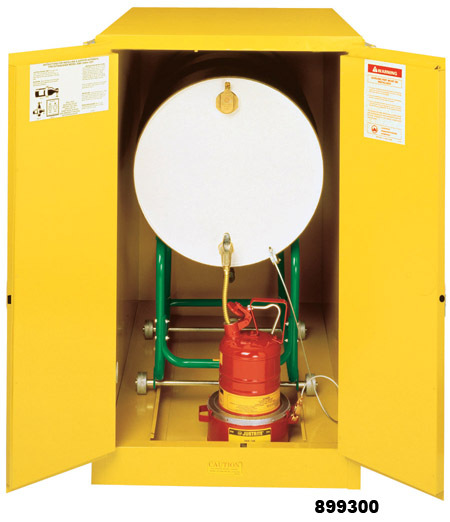 Cabinets are also designed to accommodate a drum equipped with a pump or funnel so the cabinet may be used as a pumping station or for waste accumulation. Cabinets are offered with and without roller assemblies which facilitate the movement of heavy drums. Safe storage for paints and inks. 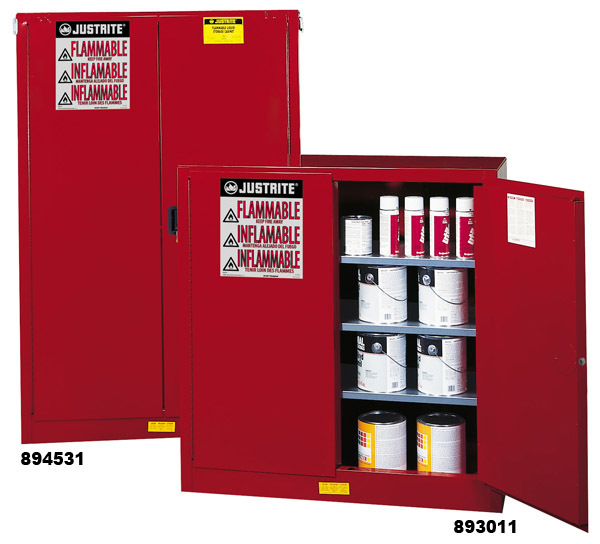 Separate and identify Class III combustibles in high performance paint and ink safety storage cabinets. 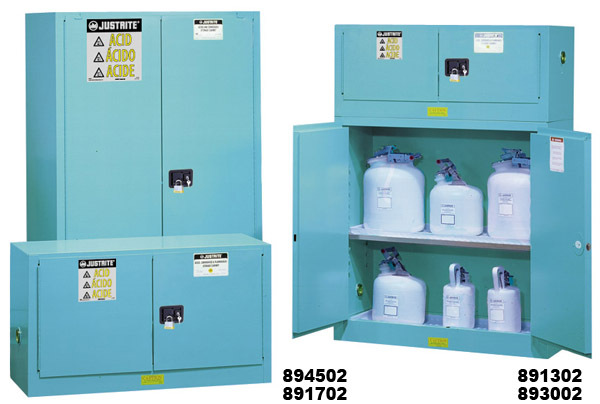 Multiple adjustable shelves accommodate many smaller paint cans, aerosols, and inks found in printing, painting, furniture and automotive operations. 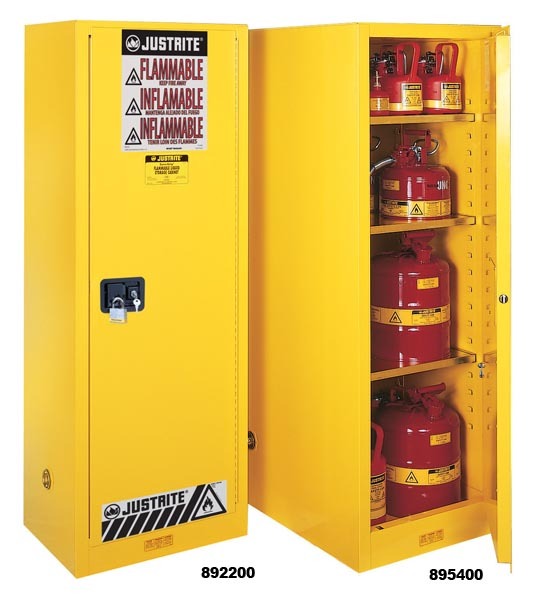 OSHA & NFPA compliant, Justrite's FM Approved Safety Cabinets are backed by an industry exclusive Ten-Year Warranty. Double wall construction with 1.5" insulating air space for fire resistance. Welded 18-gauge steel finished in tough, chemical resistant baked-on powder paint. Easy close, self-latching doors for maximum fire protection. Spill-catcher shelves catch incidental drips and adjust on 2.25" centers. Leak tight 2" sump contains spills. Three-point latch with double key set for security. Two 2" vents with integral flame arresters. Trilingual warning label identifies contents. Leveling feet included for balance on uneven surfaces. Unique hidden mechanism maximizes storage space and closes doors automatically on self-close styles. Fusible links hold doors open and melt at 165?F (74?C) to close doors shut under fire conditions. Lever or Sure-Grip® recessed handle styles are available. 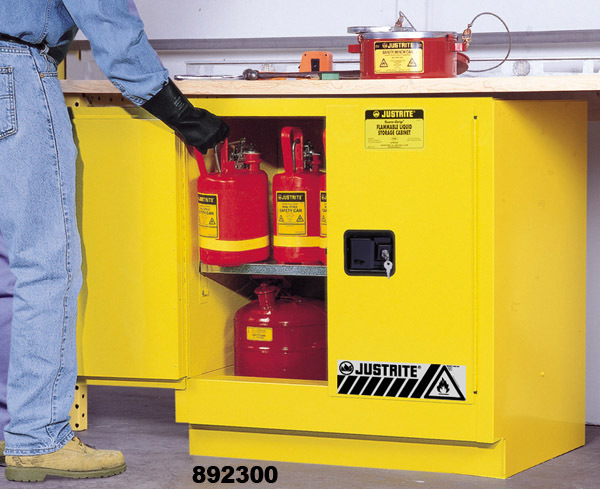 A wide variety of safe, compliant storage options for corrosives make steel cabinets a popular choice. 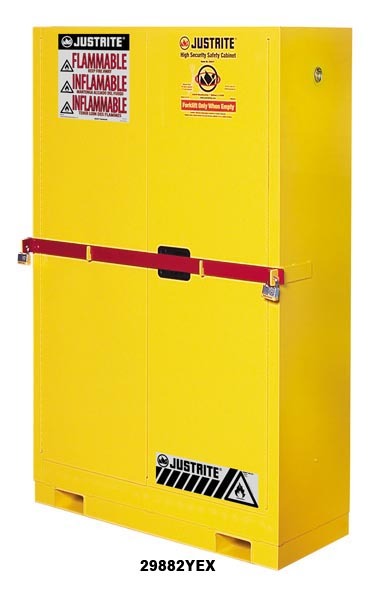 Justrite steel cabinets come in standard 30-, 45-, and 60-gallon sizes as well as Compac, Countertop, Undercounter, and Piggyback styles. 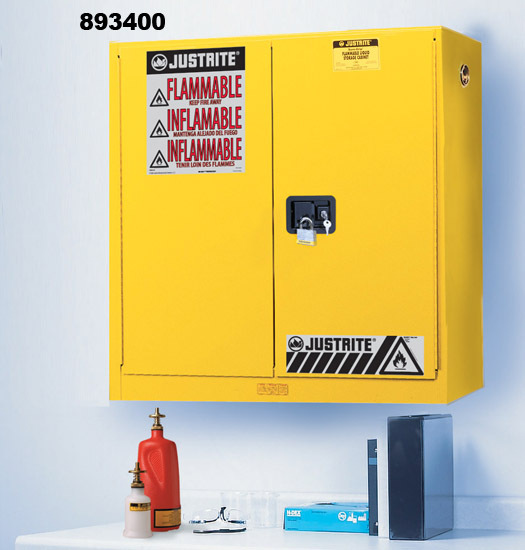 All models feature the same quality features as in Justrite's flammable cabinet including: double-wall construction, dual vents, grounding wire connections, adjustable shelves, leakproof sills, three point self-latching doors and leveling feet. 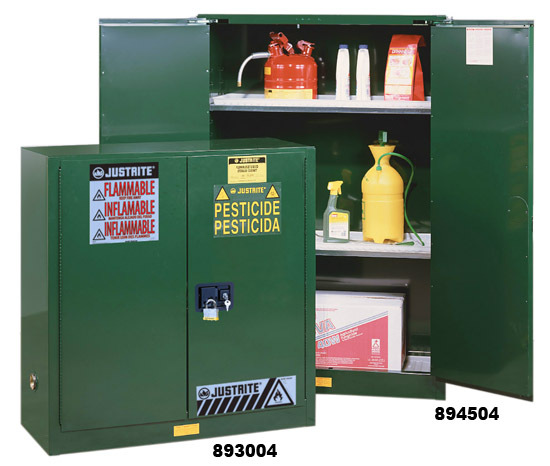 To resist aggressive chemicals, acid cabinets also include polyethylene trays attached to galvanized steel shelves and a separate polyethylene liner for the bottom sump. The liner can be removed for easy cleaning of drips and leaks. The popular 30-gallon two door cabinet also includes an extra polyethylene top work tray which can be secured to cabinet top for a handy work surface. An all epoxy baked-on powder coat finish, inside and out, provides increased chemical resistance. Paint is exclusively formulated to resist the acids, bases, and solvents often used in laboratories. 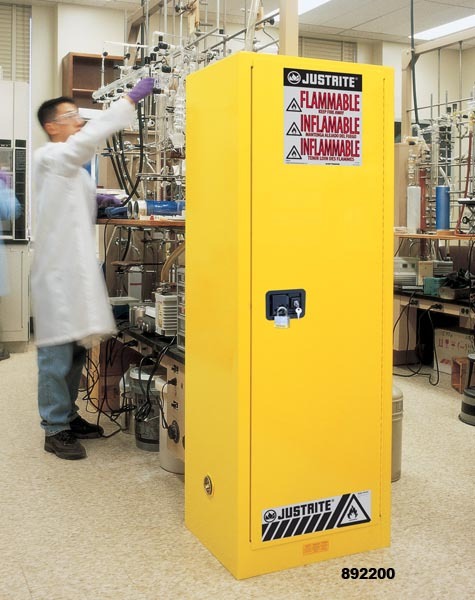 All ChemCor® lined safety cabinets include two labels to be placed on the cabinet by the end user: "Base" or reflective Haz-Alert™ "Acid" depending upon contents stored. Shelving adjusts on 3" (76mm) centers for storage versatility. The 30 gallon (110L) 2-door models include an extra polyethylene work tray which can be secured to cabinet top for a handy work surface. 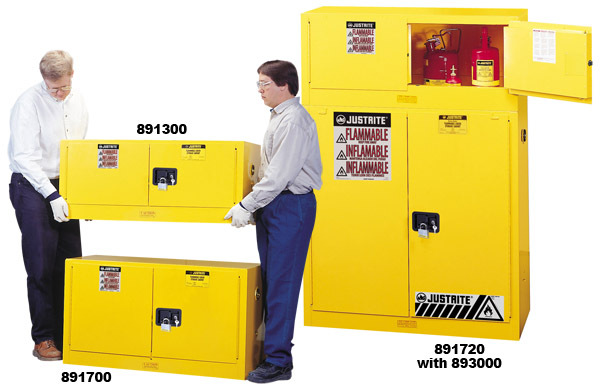 One-piece Polyethylene Cabinets offer maximum protection against harsh acids and corrosives. 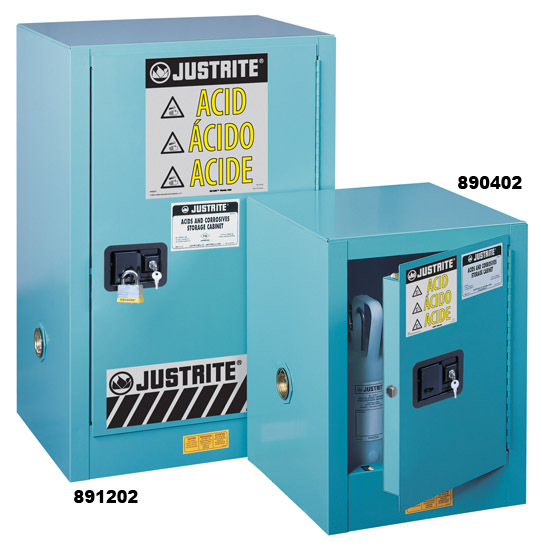 For highly corrosive acids Justrite's polyethylene cabinets offer the most resistance to chemical corrosion and leaks. Both models are clearly labeled for ACID contents and accept a padlock (not included) for added security. 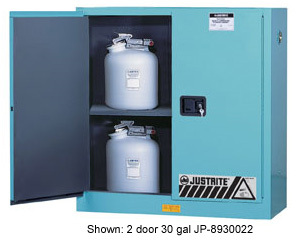 Countertop Polyethylene Cabinet stores up to two 4-liter bottles. Door can be hinged from either side for best countertop space utilization. Polyethylene spill tray inside contains leaks and removes for easy cleaning. A separate polyethylene tray stores under cabinet and can be used as a handy work tray. 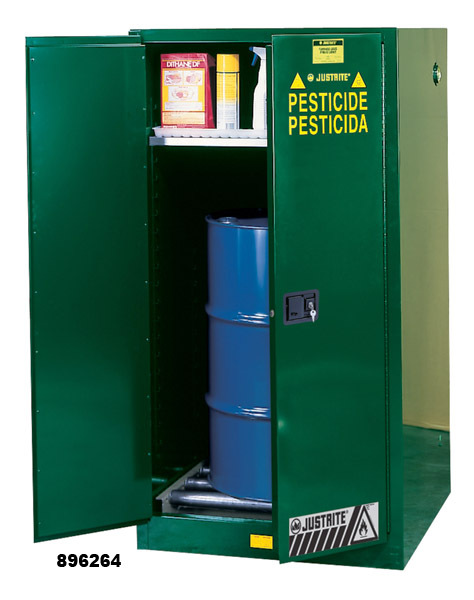 Undercounter Polyethylene Cabinet safely stores thirty 1-liter bottles or a variety of containers. Each segregated compartment has an adjustable shelf and storage in both doors for small containers. Two removable sumps slide out for easy cleaning of incidental spills. Two vent holes (with removable caps) on backside accommodate pressurized vapor removal systems. Reduce the risk of accidental poisoning and fires. H x W x D Approv./Lstg.